Port Angeles, with a population of about 19,000, is a harbor town located on the shores of the Strait of Juan de Fuca at the north end of the Olympic Peninsula and just a few miles from Olympic National Park and the Olympic Mountains. The Strait of Juan de Fuca is a substantial body of water that runs between Washington's Olympic Peninsula and British Columbia's Vancouver Island and provides access to the Pacific Ocean from Puget Sound. The Strait of Juan de Fuca is a major thoroughfare for passenger and cargo ships heading for Canadian and U.S. ports. Port Angeles is blessed in both water and land. The city plays steward to their beautiful marine shoreline and to the Olympic Mountains protecting the town. Port Angeles prime location allows residents, and visitors, access to forests, streams, lakes, and a shoreline bustling with activity. Port Angeles is just a short 17 mile drive to the nearby, beautiful and diverse, Olympic National Park. A $15 entrance fee, good for seven days, is charged for all vehicles entering Olympic National Park. Those on foot, bicycle, or motorcycle cost $5. One of the Park's most popular attractions, Hurricane Ridge, rises nearly a mile above sea-level, and provides outstanding views looking south into the heart of the Olympic Mountains. Turn around and look north across the Strait of Juan de Fuca and one often can make out the city of Victoria on Vancouver Island in Canada's province of British Columbia. Hurricane Ridge has hiking trails that lead to subalpine lakes and valleys. These trails can be enjoyed year round through hiking, backpacking, bicycling, snowshoeing, cross country skiing, and sledding. Hurricane Ridge bus tours are offered June through mid-September and leave from the Coho ferry dock. Lake Crescent in Olympic National Park is a popular location for swimming, diving, and fishing. Other popular outdoor activities include fishing and whale watching. Two other fishing lakes, at which you can launch your own watercraft, include Lake Aldwell and Lake Sutherland. Fishing charters and guides are available in Port Angeles. A popular destination for weekend and holiday travelers, Port Angeles is frequently visited by residents of nearby major metropolitan areas. Go Northwest photo by Ray Maxwell. From Seattle to Port Angeles: Port Angeles is accessible by air on commuter flights from Seattle. Passenger Ferries also are available to transport travelers. It is also possible to drive to Port Angeles with part of the trip taking advantage of a car ferry, or if you choose to skip the ferry, the drive is about 2.5 hours. From Tacoma to Port Angeles: From Tacoma, visitors need to take Highway US-101/Olympic Highway up the Olympic Peninsula. Flights also are available out of SeaTac International Airport. From Everett to Port Angeles: To travel from Everett you can either drive around Puget Sound, getting on Highway US-101/Olympic Highway out on the peninsula, or catch a ferry from Seattle. Port Angeles also is a popular travel destination for vacationers visiting Olympic National Park and Olympic National Forest, those visiting the cities featured in the popular "Twilight" book series, and those who are traveling along US Highway 101 along the Washington Coast. Port Angeles offers a rich variety of lodging options. Browse through our accommodation listings including more than 40 hotel, and bed and breakfasts choices, providing you with links to book your next stay. Surrounded by nature, Port Angeles makes an ideal location for camping. See our Campgrounds link for more information. Port Angeles also has private downtown hostels that offer discounted rooms. 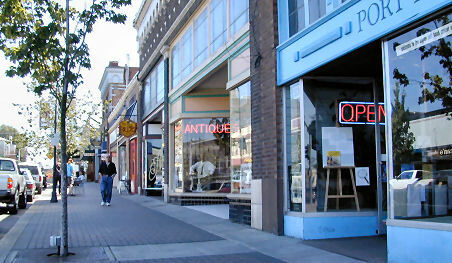 The city's unique location along the Strait of Juan de Fuca makes Port Angeles a popular destination for enjoyment of its own marine-related attractions including the city's shops, parks, shoreline, and festivals. 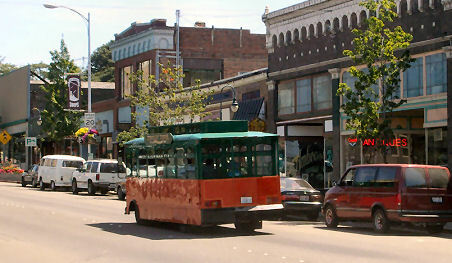 Several walking tours are offered in Port Angeles, one being Heritage Tours, which includes visiting the historic Port Angeles underground and downtown harbor. Heritage Tours leave every half hour between 10am and 4pm on Saturday and between 10am and 2pm on Sunday. Tours start at in the Atrium of the Landing Mall on Railroad Avenue. Another popular attraction is the Coast Guard Helicopter Search and Rescue Demonstrations. The demonstrations are held on Hollywood Beach, Saturday's at 1pm and Sundays at 12 noon. Some visitors to Port Angeles also may want to explore the Art Feiro Marine Life Center, a marine laboratory operated by the Peninsula College, which features large touch tanks and live exhibits of local marine life. Others may enjoy climbing City Pier Tower to watch the sun go down. Port Angeles and its neighboring communities host numerous festivals including Juan de Fuca Festival of the Arts, Arts in Action Street Fair & Sand Sculpture, Sequim Lavender Festival, Joyce Daze Blackberry Festival, Strait Blue Grass Festival, Dungeness Crab & Seafood Festival, and the Forest Storytelling Festival. With many different accommodations, activities, attractions, dining, and shopping, Port Angeles is an ideal spot for a relaxing vacation.